Mount Everest base camp hike in 12 days? Challenge accepted! Since we went to Nepal for the first time, Jeff, our friend Jess and I always dreamed of going back and doing the famous Mount Everest base camp hike. We decided to do it at the end of Jeff and I’s 6 months around the world travels, to finish on the best note possible! Here is everything you need to know about theMount Everest base camp hike, including the logistics, permits, weather, gear, costs, full itinerary and our tips and tricks after having done it in December. No Mount Everest Base Camp hike is without a stop before, and after, in bustling Kathmandu - one of our favorite cities in the world. One thing that you must be prepared for before you head for the trek is the lack of comfort you’ll have for the next couple weeks, this is unavoidable. So, in while you spend a couple days in the capital of Nepal, make sure you get a couple good nights of rest first. Our pick, as always, is the comfortable and friendly Radisson Hotel Kathmandu in the quiet and convenient Lazimpat neighborhood. The staff is extremely friendly, can arrange airport pick-up and drop-off anytime (very handy with all that gear), and will also offer to hold your extra luggage while you trek which you can pick up after your trek. Aside from extremely comfortable and quiet rooms which is much needed before and after all that hiking, their restaurant serves a delicious breakfast and international dinner buffet, and if the weather is nice enough there is a gorgeous rooftop lounge and pool. Now, once you’ve gotten your beauty rest and picked up all your last minute hiking gear, who is ready to go for a little hike?! The trek with start with your Katmandu to Lukla flight. Make sure to book it ahead, to make sure you get your preferred day and time slot. Flights usually depart in the morning and last for about 30-45 minutes. There are 6 flights a day from Katmandu to Lukla, between 6:15am and 7:45am. You can take up to 10kg with you, usually in your backpack (or duffel if you have a porter). Tip: Bear in mind that during high season, the flights gets delayed or cancelled often, due to the weather conditions having to be perfect both in Katmandu and Lukla. It’s best to plan a couple days on each end just in case this happens to your flight. We’re a bit hesitant to give out specifics and details about the permits because the rules and regulations seem to change so fast. We had read multiple reports about how to do this and while they were recent, things we different once we arrived. The morning after we landed in Kathmandu we went directly to the Department of Culture and Tourism office where we were promptly told we didn’t need to be there to apply for the permit to the national park and could in fact get it when we started the trek in Lukla. However, you do need to submit applications here for other national parks and treks, most noticeably, Anapurna. The applications used to be submitted here, and you can still get the forms, but they no longer require it. With lots of controversy and confusion, you no longer need the previously required Trekker’s Information Management System (TIMS) card as of the writing of this article, (March 2019), but please check again before planning your trip. This post is a much more detailed review of the entire Mount Everest Base Camp trek permit details and will be likely updated more often than this post. As of October 2018 you can collect and pay for the local government of Khumbu permit directly in Lukla for NPR 2000 per hike. Note that this permits cannot be obtained in Kathmandu. If you are starting your trek to Everest Base Camp like the vast majority of hikers you can obtain this is Lukla. If you are trekking from Jiri or Salleri this can be obtained in Monjo before you enter the Sagarmatha National Park. Note: An additional permit is required if you trek from Jiri. This is an existing permit system for entering National Park and while you can obtain it either in Kathmandu at the Nepal Tourism Board Office or in Monjo at Park Entrance Gate, I would just do it all once you start the trek instead of spending a frustrating day in Kathmandu traffic for no reason. This permit will cost NPR 3390 per hiker. The office at Monjo, also has a lot of relevant, and more importantly up to date, information about the entire Khumbu Region, any important updates, weather, etc. The weather will greatly depend on the time of year you are attempting the trek to Everest base camp. During the high season, the weather can be quite unpredictable. We trekked during the low season, beginning of December, and while it was (very!) cold, down to -25 celcius at the highest point we slept, the days were beautiful, clear blue skies and not too cold while we were in movement. Since Jeff and I were traveling and spent a month in Bali before our Everest base camp trek, we were wildly unprepared for the trek. We did have base layers and some long sleeves, but not much else! However, it is good to know that you can find everything you need in Katmandu, Lukla or even higher, up to Namche Bazaar at 3,400m - however, it does get a little more expensive as you go up, of course. We strongly recommend to rent sleeping bags and down jackets - we rented both of those for about $2.50 per day per person at the Kala Pattar shop in Thamel, Katmandu. We also bought the rest of our hiking gear, including hiking backpacks, hiking boots, gloves, hats, neck warmers, fleece-doubled hiking pants and warm socks at the same shop - the more you buy, the more you can haggle! Aside from finding a good backpack to carry everything on your back, it is an absolute must that you also have an easy access bag, like a bumbag, for all those things you’ll be needing easy access to like your phone, chapstick, tissues, money, permits, snacks, camera, etc. We highlight recommend Eastpak products, and neither of us travel anywhere without their bumbags around our necks. It is important to inform yourself and your group members about the effects of altitude and AMS (Acute Mountain Sickness). Early symptoms from 2,500m can include a strong headache, and you need to stop climbing. Start descending immediately if you experience dizziness, shortness of breath while resting, nausea or exhaustion in addition to the headache. AMS can lead to HAPE (high altitude pulmonary oedema) or HACE (high altitude cerebral oedema), which are both life threatening, but usually only occur at very high altitude. Make sure to be aware and to follow the recommendations to avoid AMS, and don’t climb more than 500 meters a day above 3,000 meters. If you are feeling unwell, you can inform the lodge owners, they are very helpful and most can organize a helicopter rescue if needed. If you experience any symptoms of altitude sickness do not ascend further. If symptoms persist after resting at the same altitude, descend further. You can avoid AMS by drinking a lot of fluids, water that you can supplement with electrolytes tablets to buy in Katmandu. Make sure that your trek has enough acclimatization days to allow your body to rest and get used to the altitude (refer to the itinerary below). If you feel any symptoms, don’t be afraid to voice them out, even if you are in a group where everyone else if feeling fine. You can consider taking altitude sickness medication called Diamox, that you can get in Katmandu and in several lodges along the way. Make sure to continue taking it until you are back at the same elevation or lower than when you started taking medication. (As always, consult your doctor before taking any medicine!). Diamox should not be taken by pregnant women or anyone with liver or kidney issues. These backpacks fit all our clothes, gear, sleeping bags and accessories for the trek. These are costs for two people, including the expensive flight from Katmandu to Lukla. If you are more flexible, you can definitely get a cheaper flight! Total: $1575 for two, or about $790 per person, for 12 days. Note that these are estimations, and you should always have way more than necessary in local money, cash, just in case. Our itinerary was based off a few recommendations we found online, and was tweaked to work for us. Don’t hesitate to consult a few articles and make your own, depending on the fitness level of your group. In any case, do not attempt to do the trek in less than 12 days - you should allow at least 8 days to go up to Base Camp, in order to get the necessary adaptation days and not suffer from AMS too early (we’re speaking from experience!). The trek to Everest base camp starts with a relatively nerve wracking flight, in the smallest plane we’ve ever taken - only 7 seats, and one flight attendant! You will be offered mints and cotton for your ears as the plane takes off from Katmandu and zigzags in between mountains to approach Tenzing–Hillary Airport in Lukla. Tip: Make sure to seat on the plane’s left side for the best views of the Himalayas! You will see Lukla’s famous short landing strip with its 11.7% gradient appear in front of you. While it can make you nervous, embrace the feeling of landing on the 500m strip, it will definitely be a good story to tell! Once you get out of the plane, you will find yourself in the second smallest airport in the world. From there, grab your bag, and let’s head on the trek! You should normally arrive early morning, before 8.30am, so you can be in Phakding for lunch. Start walking on the path and enjoy the first 2 hours going downhill - how easy, you will think. Beware, as you will have to go up during the last 2 hours of the trek! Stop in Phakding for lunch halfway, and continue another 3 hours of uphill hiking to Monjo, through beautiful sceneries with prayer wheels and suspended bridges where you can spend your first night. Within the first few hours we were already crossing these hair-raising bridges! Wake up, have breakfast at your lodge, and let’s start day 2! It’s a fairly short hiking day, but make sure to not overdo it, as you will start getting quite high. The main keyword is: SLOW! The first hour will be easy, and after the longest bridge yet, you will start going uphill. Make sure to stay hydrated! Once you arrive in Namche Bazaar, check in to your lodge for two nights, and explore the little town up 3,440 meters high. Go for coffee or hot chocolate (and most importantly, a slice of walnut brownie) at the Himalayan Java Coffee - you can charge your devices and use the WiFi there if you’d like. Note: Namche Bazaar is your last stop to buy gear and get money out at the ATM, but it doesn’t work all the time, so be safe and get enough cash in Katmandu! You don’t want to be without cash on Everest, believe us. Today is an acclimatization day, meaning you will still hike, but come back to sleep in Namche Bazaar. It is recommended to go up to the Hotel Everest View, at almost 4,000 meters high, to get your body ready to climb higher in the next days. If you are not feeling well, you can add a day of resting in Namche Bazaar, but make sure you do the acclimatization hike before going higher. The hike will bring your to Hotel Everest View, where you can enjoy a coffee or a pot of hot chocolate with a beautiful view of Mount Everest. If you have energy left and you feel like it (disclaimer: we didn’t), you can explore the surrounding valley towns of Khumjung and Khunde. Note: Many coffee shops in Namche Bazaar have a movie or a documentary showing around 3pm (usually Into Thin Air, Everest and the like). Make sure to check around! Start from Namche Bazaar around 8am, and trek your way downhill through the beautiful forest to Phunke Tenga. Once arrived there, make sure to stop and get some energy for the long uphill section awaiting you. Go slow and steady, stay hydrated and don’t forget to stop regularly to enjoy the beautiful views. Once arrived in Tengboche, check in the lodge of your choice, and get some rest, you deserve it! As we made our way up to Namche Bazar, the temperatures started to drop to well below zero at night, and the scenery started to get more and more stunning. Leaving Tengboche in the morning, continue your trek through the deep river valley. Stop for lunch and rest in Somare and start your journey up through dusty roads to Dingboche. Don’t forget to look up and admire Ama Dablam, one of the most beautiful mountains we saw on this trek. As usual, remember to drink a lot of water and stop regularly. It’s not a race! Check in Dingboche for two nights - tomorrow is an acclimatization day. Today is the day you can sleep in - at least a little bit. After breakfast, head on the acclimatization hike which will bring you up the hill behind Dingboche. Go up as much as you can, reaching the vertical prayer flags at 14,665ft / 4,470m or even at the top of the ridge at 16,676ft / 5,083m. It will be a difficult hike up, but remember that the higher you go, the easier it will be to continue the trek. Once you made it as high as possible, come back down, enjoy a slice of cake at the French Bakery and sleep down in Dingboche. What else could be better this far into your Mount Everest base camp hike? If you have any headache, or trouble coping with altitude, there is a pharmacy by the French Bakery. Ask the pharmacist for advice, she’s very nice and helpful! You can also buy Diamox (altitude sickness medication) there. Start bright and early from Dingboche, around 8am, after breakfast. After trekking through the dusty valleys to Thukla, stop for a bite and a rest. Remember to take it slow, you are getting quite high and altitude will wear you out quicker than usual. Go as slow as you need! You will then embark on one of the hardest sections of the trek, a difficult uphill through dusty roads. Once you reach the prayer flags and the memorial to lost trekkers and sherpas, you made it to the top. Rest a bit, and start the final stretch downhill to Lobuche, where you’ll sleep tonight. Note: This is where our itinerary differs from most you will find somewhere else on the internet. We decided to go back to sleep in Lobuche on Day 8 which means we hiked 12 hours from Lobuche - EBC - Lobuche on day 8, rather than sleeping up in Gorak Shep. The reason behind this, is because it was mid-December and Lobuche was -25 °C (-13 °F) by night (reminder: there is no heating in lodges on the Everest trek!) so we decided not to sleep higher than Lobuche. This means that we didn’t climb Kala Pattar, but that was a personal decision. If you want to climb Kala Pattar to get views of Mount Everest, you will need to sleep in Gorak She and do it at sunrise (recommended) before going down. You do you! Nothing on Earth can prepare you for the beauty you find along the trail as the mountains start to appear. Simply breathtaking! This is the big day!! After a very cold night in Lobuche (depending on when you’re going, but in December, it was -25 °C (-13 °F) brrrr! ), start heading towards Gorak Shep. The trek will be slow and difficult because of the altitude, but you’re almost there. After a steep section through hills, you will arrive in Gorak Shep. Continue walking behind the lodges, you will see the sign pointing to Everest Base Camp - so close! Trek across the desert at more than 5,000m high and get onto ridgeline trail. After a few hours of hiking, you will see an “Everest Base Camp” sign - but this is NOT it! Continue for an hour or so, you will have a glimpse at the famous Khumbu Icefall, and then head down in the rocky valley. If you are going during high season, you will have the chance to see the multiple tents of expeditions getting ready for the summit attempt! 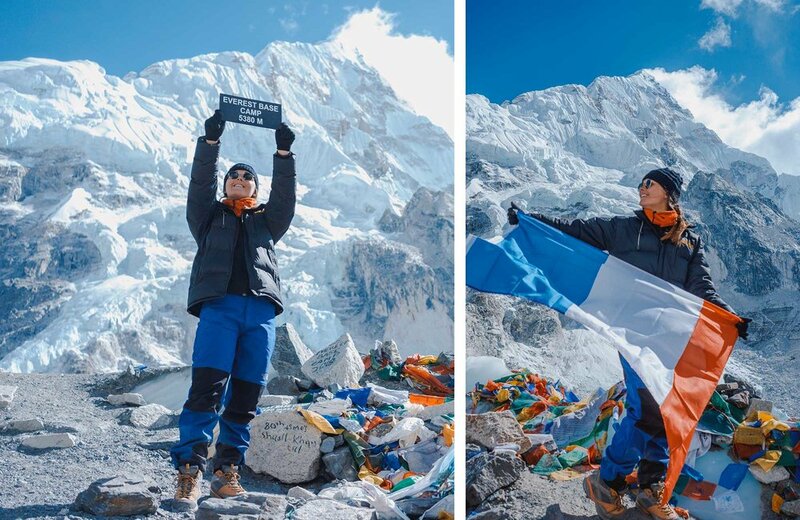 You will soon see the Everest Base Camp prayer flags, pictures and messages from everyone around the world who made it - you can be proud of yourself! After snapping a few pics (and why not, showing off proudly your flag, that you would have brought up AND back, of course), it’s time to get down! Take the same trail back and if you feel like it, head back to Lobuche for a well deserved night of sleep - the last one at this altitude! Note: if you intend to go all the way to Namche Bazaar, depart EARLY. We left at 8am and had to hiked for an hour in the dark - NOT fun. Either way, always carry a least one headlamp per person, I promise you, you don’t want to be stranded in complete darkness on the trek. This is the day you can officially start getting down - although, as you know now, going lower in elevation doesn’t necessarily mean trekking down all the way! Start by retracing your steps from Lobuche to Pheriche, to Somare and to Tengboche. You can stop here, or you can (as we did, but we were VERY motivated to go as low as possible) continue to Namche Bazaar. From Tengboche to Namche Bazaar is the very long uphill, which will be difficult at this stage of the trek. Make sure to do it in your own time. After another hour or so of flat trekking, you will arrive in Namche Bazaar - success! If you stopped in Tengboche the night before, it’s now time to tackle the 3 hours uphill to Namche Bazaar. If you went all the way to Namche, then get some rest - you will need it today. Either way, once in Namche, if you’re staying at the Khundu Lodge as we did, it’s time to grab a book, curl in the seats and and drink honey ginger tea! If you feel like it, pop by the Himalayan Coffee for a walnut brownie - you deserve it. Now that you’re well rested, it’s time for the last big portion of the trek, back to Lukla! Every step will feel good, as you know you are going lower in altitude, and oxygen will feel amazing! Don’t forget the last 2 hours which are uphill - but after the whole trek and especially the hike up to Namche Bazaar, this will feel easy. Feel the satisfaction and happiness as you pass by the entrance to Lukla, and see the hikers on their way to where you just came from. Since all the flights from Lukla to Katmandu are in the morning, you will have to sleep in Lukla. Time to get onto your small plane back to Katmandu, and home, or onto your next adventure! Tip: Book a nicer than usual hotel in Katmandu on your way back, you will LOVE the shower and comfortable bed! Rent a good sleeping back, valid for -20C temperatures, this will literally save your life! Or at least your toes, especially in winter. We were lucky with our (new…) hiking boots, but this is a huge risk. It’s always better to pack broken in hiking boots, or buy some in Katmandu and break them in there! We only back two full outfits (yoga type pants, base layers, second layers, top layers) with a few pairs of underwear and socks, one down jacket, neck warmer, hiking pants, boots and that’s it! Don’t pack too much, you will carry it on your back! We had each about 11 kg in our backpacks. We were advised not to shower, at least on the way up, as this is the best way to get sick and not make it. You can take a shower at your own risk, but believe us you won’t want to remove any item of clothing most of the time! No shower means.. baby wipes are your friends! This will help you feel somewhat human on the last days of the trip. Invaluable! While water bottles costs only about 100 NPR up to Namche Bazaar, their price increase to unreasonable amounts the higher you go - of course, they need to be brought up there! Since you need to drink a huge amount of water, bring purification tablets. You will find them everywhere in Thamel, Katmandu. Put a tablet in 1 litre of water, and wait 30 mins before drinking. It won’t taste great, but it kills bacteria! Even in December, it was fairly warm during the day, with clear blue skies. When you hike for hours on end, especially uphills, you will appreciate removing some layers, so make sure you have a base layer, a middle layer and a top layer on. We usually started around 8am every day. On long days, you might want to start even earlier. Let’s be honest, you will be awake, and sleeping in when there’s no heating isn’t the most enjoyable. Check with your lodge at what time they serve breakfast (usually from 7am) and get out as early as you can. This way, you can take all the time you need to reach your next point. If you arrive early at your next stop, this will give you more time to rest in the afternoon. As a general rule, it’s best to not eat meat on the Everest base camp trek. Slaughtering animals is forbidden in the whole Sagarmatha National Park, meaning all meat has to been flown to Lukla and brought up on yaks - meaning there are high chances the meat won’t be fresh, and you might get sick. Not worth it! We recommend sticking to vegetarian fried rice, noodles, soups, and dhal bat. From our experience, “western food” was fine up to Namche Bazaar, but we didn’t try it afterwards. Up to you! You will pass many beautiful engraved stones, called Mani Stones. They are large and small stones engraved with a short piece of writing in Tibetan, “om mani padme um” (a loose translation is "hail to the jewel in the lotus”). Make sure to pass them by the left side, in a clockwise direction. This is the direction that the universe spins according to Buddhist belief! You will pass a ton of horses, donkeys and yak trains along the trek. Recognisable at the sound of their bells, they will not care if you are on the way. Always stick to the mountain side, and let them pass you. We truly had no idea what we were in for and it turned out to be the trip of a lifetime! This is it, our full guide to Everest base camp in 12 days! If you have any questions, ask them below in the comments - we will soon publish a whole Q&As article about this trek.